handles the ball deliberately (except for the goalkeeper within his own penalty area). touches the ball with his hands after he has received it directly from a throw-in taken by a teammate. commits any other offence, not previously mentioned in Law 12, for which play is stopped to caution or dismiss a player. An indirect free kick is taken from where the offence occurred. The referee has the authority to take disciplinary sanctions, as from the moment he enters the field of play until he leaves the field of play after the final whistle. deliberately leaves the field of play without The Referee's permission. A player who has been sent off must leave the vicinity of the field of play and the technical area. Subject to the terms of Law 12, a player may pass the ball to his own goalkeeper using his head or chest or knee, etc. If, however, in the opinion of the referee, a player uses a deliberate trick while the ball is in play in order to circumvent the Law, the player is guilty of unsporting behavior. He is cautioned, shown the yellow card and an indirect free kick is awarded to the opposing team from the place where the infringement occurred. A player using a deliberate trick to circumvent the Law while he is taking a free kick is cautioned for unsporting behavior and shown the yellow card. The free kick is retaken. In such circumstances, it is irrelevant whether the goalkeeper subsequently touches the ball with his hands or not. The offence is committed by the player in attempting to circumvent both the letter and the spirit of Law 12. A tackle, which endangers the safety of an opponent, must be sanctioned as serious foul play. Any simulating action anywhere on the field, which is intended to deceive the referee, must be sanctioned as unsporting behavior. 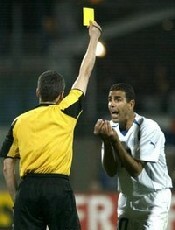 A player who removes his jersey when celebrating a goal must be cautioned for unsporting behavior. Removing a jersey after a goal has been scored is unnecessary and players must avoid such excessive displays of celebration. Removing a jersey is defined as removing the jersey over the head or covering the head with the jersey.